I don’t write much anymore, lacking both time and inclination. The church doesn’t listen. By and large, I mean. The church I used to know has no ears for this, and there’s little point writing to them. The people on the outside, on the fringe, the ones who mistrust the church and cannot reconcile the Jesus they read in the Bible with the one that is preached at them from the pulpit — these people listen. But they already know most of the things I write about. On the other hand, I’ve found writing to be cathartic as well as helpful in processing my thoughts, as evidenced in the many pages of this blog. And I don’t read much on these subjects anymore unless they fall directly in my path, as when some asinine boneheaded comments are made on Facebook or in the pages of Christian publication or blog that gets passed around, and I sometimes still begin to compose a response in my head. Because I don’t write it, the response usually fizzles before it is fully formed since there is no audience for it but the converted. The unconverted do not wish to hear it, and sometimes it’s just outrageous. I shake my head and move along. There’s a lot of that during the election season. At the moment, it’s someone’s Facebook post from a few days ago that takes an article from what seems to be a fringe group offering alternative information for investors as a counter to financial journalism, and applies it to an anti-Clinton (USA) anti-Liberal (Canada) bias garbed in the Christian militaristic triumphalism of the new prophetic apostolic intercessory club. Where do I start? 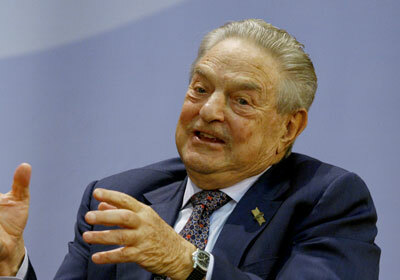 The fact that George Soros is not the international puppetmaster of Western democratic governments? Or the fact that concern for poverty and immigrants (again at the risk of redundancy) is pretty far from being considered heinous? Or do I zero in on the poster’s subsequent postings about wanting to change the world for the better, and to be on the right side of issues, which is then defined as the side of love and humanity, so I can point out the inherent hypocrisy? I might point out that George Soros is only one of many billionaires who later in life choose to embark on philanthropic pursuits, like Bill Gates, Warren Buffett, and even a much younger Mark Zuckerburg. Because once you amass all of that wealth, it eventually hits you that you’re in a position to change things, and you realize it’s incumbent upon you to do your level best to bring positive change out of what you’ve earned. This is somewhat natural, though it’s rare (if not unprecedented) in history for us to see it so publicly and from as many concurrent sources as we do today. Maybe we could even let him speak for himself on Why [he’s] Investing $500 Million in Migrants (“I will invest in startups, established companies, social-impact initiatives and businesses founded by migrants and refugees”), but that would probably be misconstrued straight back into a conspiracy theory founded on mistrust of migrants. I might point out that partnering with the UN to export a Canadian model is hardly “meddling” in the Canadian government, but that hardly seems the most grievous misrepresentation at hand. I could point out that these are the same tactics utilized by the American Government, often with much worse far-reaching effects. It is claimed that Soros then invested in these economies and profited, but one could (or should) argue that investment is what was needed at the time in order to bring stability. There seems to be some issue being taken with the fact that some of these high-risk investments may have yielded a fairly decent return. Pretty jaded. The article continues with additional unsubstantiated claims as it paints a conspiracy, but the deeper you read, the more you start to think it all comes down to the author’s dislike of the Clintons and of Soros’ donations to the Democratic Party. I don’t have an encyclopedic knowledge of George Soros’ activities, but I can see enough to know that the representation here is pretty one-sided and employs several leaps of logic with attributions of motivation and knowledge-gaps plugged with assumption. But more to the point, if one is trying to show that Soros is evil, this doesn’t do it, and especially doesn’t do it in a Christian context where concern for foreigners is supposed to be a defining value. So maybe I just skip to the end, to a little paragraph from Leviticus (NET)? This is where the matter should end. Two crucial verses about how to treat foreigners based on the permanent memory that Israel was (read: we were) also at one time foreigners. This is unequivocal: if the person lives there, treat him like he belongs there, and show equal concern for him as you do for yourself. These are words that I have a hard time reconciling with what I see in the attitude so prevalent in the brand of (literal and figurative) microphone-wielding christianity of today. Perhaps it’s a matter of context. And in a US presidential election year where immigration policy has become for one candidate the defining issue of the ages, it’s hard not to consider that as part of the context. Yes, Republicans, we’re looking at you. Whether or not the party has the sense to lie down and die after it loses the coming election, there’s a strong suspicion about that we’re witnessing the end of it. If not, then maybe we’re seeing the end of a two-party system (something your first presidents warned against anyway). The Republican Party is no longer the voice of traditional conservatives; it’s become the voice of those afraid of immigration. A poll this past June found that “one of the most indicative variables in determining Republican identification this year was agreement with the statement that the ‘number of immigrants who come to the United States each year’ should ‘decrease. '” This, of course, is a statement that has little to do with traditional conservative values and much more to do with the Tea Party, which Jeff Daniels’ character in The Newsroom memorably called “the American Taliban.” (Thank you, Aaron Sorkin.) By some analysis, the base of the party is becoming older, whiter, and less educated, perhaps culminating in Trump’s taking control of it with fearmongering against Mexicans and Muslims as he forcibly widens social chasms in an already deeply-divided America. Traditional conservatives have found themselves without a party, and are looking increasingly seasick as they try to hold onto some kind of alignment with the GOP with which they established their fiscally-conservative bona-fides. Trump is creating a dual-edged new segregation in a “US-versus-M&M” kind of internal war which he refuses to acknowledge as a civil war and not an international one. If you wanted to sow seeds of discord and secession, you could do no better than to follow his strategy. In the meantime, he’s got the Christian right gathered into his party with anti-immigration rhetoric, and unlike the fiscal conservatives who are starting to see the gap between themselves and their party, the Christian right is parroting an anti-Christian party line on dealing with foreigners without stopping to think how far they’ve strayed from the moral code set down by their founder. It’s becoming single-issue politics again. (Need I really point out what a bad thing this is? At least this time it’s not abortion.) Trump continually waves the immigration flag like a magician distracting his audience from the hand where the real trick is being played. So dedicated is he in this effort that when talking about healthcare platform, it seems to be summed up with “We’re going to have the greatest ideas–it’s going to be great.” Apparently he doesn’t even have the ideas yet, but you don’t notice that if you don’t take your eyes off of the immigration flag waving in his other hand. Give your head a shake, people. You’re establishing a new segregation — even if you can’t accept your own scriptural mandate here, do you really want to be on the wrong side of history with this? Again? You should be far more afraid of what Trump has up his other sleeve than you are about someone who looks, thinks, or talks differently than you do. And that’s what this election is down to — what do you fear more?